Pleurisy Root Extract 4 fl. oz. 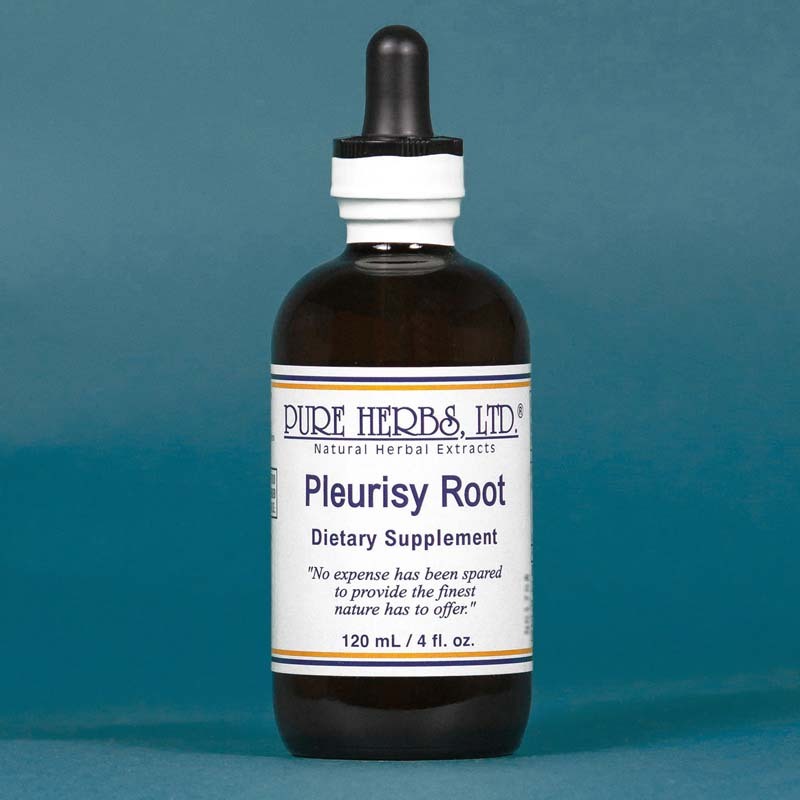 Pleurisy Root - Pure Herbs Pleurisy Root supports the maintenance of a healthy respiratory system and circulatory system. * Asclepias tuberosa, L. Parts used: root. PLEURISY ROOT ( Orange flowered Butterfly Plant ) - Venereal disease, reduce high blood pressure, give in cases of weak heart beat, correct hardening of the arteries, restore circulation, reduce cardiac edema (fluid retention due to heart malfunction); 80 to 90 drops after meals. Removes warts (not moles). Apply three to four times per day. Poison antidote - give 40 to 80 drops and repeat, as needed, if symptoms do not subside. Revered, as its name directly indicates, for chest infections, painful breathing, mucus and fluid accumulation in the lungs. Not a stimulant. Also, "the child's remedy" for chest and abdominal complaints, burning fevers, diarrhea; apply to temples, forehead, spine, chest and abdomen. Repeat as needed. Pleurisy Root is gentle acting and thorough. Promotes perspiration of poisons. Wrap up warm to assist this action. * DOSE:For children and little ones, 1 to 10 drops every one to two hours, while awake, on the tongue and or applied in sufficient quantity to cover chest and back. Keep wrapped and warm and then sweat it out. If the child is restless, then also give 1 to 20 drops of Scullcap on the tongue according to age and need, every one to two hours. Adults: For circulatory problems, 40 to 80 drops after meals and, additionally, when short of breath. If congestion, 40 drops on or under the tongue every hour and rub in quantity necessary, to chest and back every hour, while awake. Wrap up warm and sweat it out. If restless, 20 to 40 drops also of Scullcap every hour, while awake. For regular daily use, 10 to 40 drops after meals.